Red Foley was one of the biggest stars in country during the post-war era, a silky-voiced singer who sold some 25 million records between 1944 and 1965 and whose popularity went far in making country music a viable mainstream commodity. Born Clyde Julian Foley on June 17, 1910, in Blue Lick, KY, he began playing guitar and harmonica at a young age, and by the time he was 17 had taken first prize in a statewide talent competition. While attending college in 1930, he was spotted by a talent scout from Chicago's WLS radio and was tapped to sing with producer John Lair's Cumberland Ridge Runners, the house band on the program National Barn Dance. After seven years with the Ridge Runners, Lair created a new show, Renfro Valley Barn Dance, especially to showcase Foley's talents. The singer remained with the program until late 1939, performing everything from ballads to boogie to blues. At the same time, he became the first country artist to host his own network radio program, Avalon Time (co-hosted by comedian Red Skelton), and performed extensively in theaters and clubs and at fairs. After exiting the Renfro Valley Barn Dance, Foley returned for another seven-year stint at the National Barn Dance show. In 1941, the same year he made his film debut with Tex Ritter in the Western The Pioneers, he signed a lifetime contract with Decca Records. His first chart single, 1944's "Smoke on the Water," topped the charts for 13 consecutive weeks; in 1945, he was the first major performer to record in Nashville. 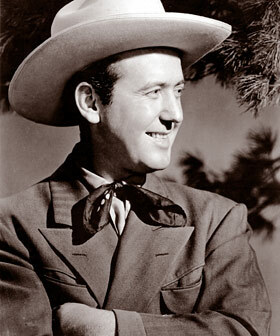 In 1946, Foley signed on to emcee and perform on The Prince Albert Show, a segment of the Grand Ole Opry program broadcast on NBC; his popularity with listeners is often credited with establishing the Opry as country's pre-eminent radio show. Beginning in 1947, he began recording with his backing band, the Cumberland Valley Boys, earning another number one single with "New Jolie Blonde (New Pretty Blonde)." With the group, he recorded seven Top Five hits between 1947 and 1949, including "Tennessee Saturday Night," a chart-topper in 1948. Again recording solo in 1950, he issued the song that would become his trademark tune, "Chattanoogie Shoe Shine Boy," which stayed in the number one position for 13 weeks. In 1951, Foley's second wife, Judy Martin (born Eva Overstake), committed suicide, reportedly over the singer's affair with another woman. In order to devote the majority of his time to raising a family, he cut back considerably on his performing commitments, although he continued to release hit after hit in a variety of musical styles, including rockabilly and R&B; "(There'll Be) Peace in the Valley (For Me)," a 1951 smash, was the first record ever to sell one million copies on the gospel charts. In the same year, he also released his first LP, Red Foley Souvenir Album. After several years spent in virtual retirement, in 1954 Foley was named to host The Ozark Jubilee, a country showcase for ABC television; the show was a hit, and ran through 1960. Also in 1954, he recorded the chart-topping "One By One," the first of many duets with Kitty Wells. After The Ozark Jubilee went off the air, he spent one season co-starring with Fess Parker in the program Mr. Smith Goes to Washington. Although Foley continued recording throughout most of the 1960s, his hit-making days were largely behind him. In 1967, he was elected to the Country Music Hall of Fame. After a performance in Fort Wayne, IN, on September 19, 1968, Foley died of a heart attack. Among the survivors were his daughter Betty, a popular country vocalist in her own right, and another daughter Shirley, the wife of pop crooner Pat Boone.